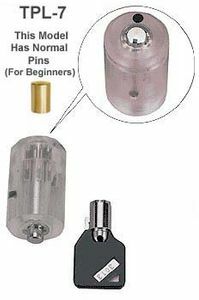 This clear plastic 7 Pin Tubular Practice Lock is one of the best training tools to learn the skills needed in picking Tubular Locks. Good insurance to be prepared before working on the real thing. The lock is built with standard pins. Includes key.